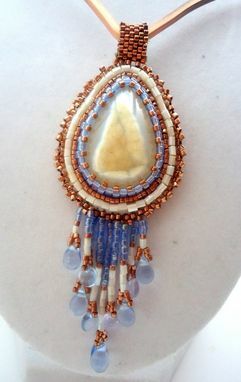 Feel like you are in the American Southwest in Spring with this gorgeous bead embroidery necklace made with a Druzy stone, seed beads, and fringe! 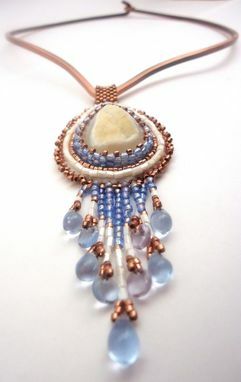 The druzy stone has a lovely cream-colored geode formation and is encapsulated by pastel blue, copper, and cream seed beads. This is all finished with a copper picot edge and backed with tan Ultrasuede. The design is finished with a lovely graduated fringe which ends in translucent blue glass beads, with alternating teardrop and coin shapes. 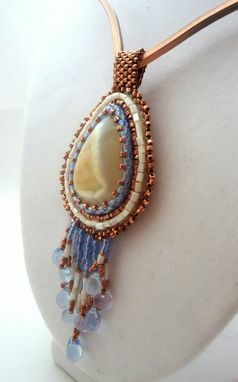 The entire pendant is hung by a peyote stitch bail from a comfortable copper collar with an easy to use closure. 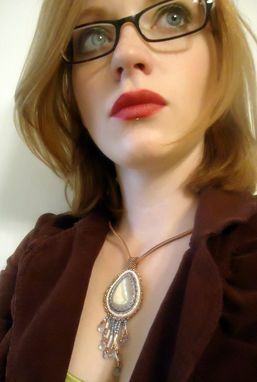 The pendant measures 4 1/4" from top to bottom of fringe, and the collar is 5 1/4" in diameter.